On the ixi-UMS Business-Server must be installed .NET Framework 3.5. 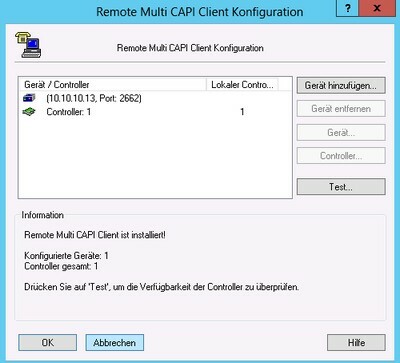 The installation file of „Remote-CAPI for MS-WINDOWS“ (at least version 1.1.7 from 07.2015 ) from „bintec elmeg“ must be stored on the ixi-UMS Business server. The ixi-UMS Software can be installed bevor or after the LANCAPI. The ixi-UMS Business Software is an 32bit-application. Therfore the installation of 32bit CAPI is required – independent of the version of the operating system. The set-up for 64 bits instal normally 32 bits CAPI. dll automatically with. Please note: the Configuration of the LANCAPI is only in german available ! Don't start the setup from inside the zip-file. At the end of the installation the configuration of the Remote CAPI is open. 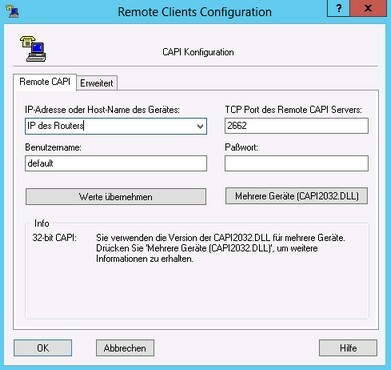 If you don't like to use the Default user, enter the CAPI user and passwort, wich you has defined in the PBX. In this window the IP address of the be.IP Plus is indicated you as "Gerät/Contoller" and under it the active controller. Should several PBX and/or bintec elmec Router be bound, you can add this here with "Gerät hinzufügen". Click on the button "Test" to make sure that the Remote-CAPI a connection with the Router can be based. The announcement means that the connection with the Router can be produced and that there a controller is furnished. The test does not check the registration data and NOT whether the ISDN connection functions. Confirm all Tabs and restart the server. For the next steps you can login via RDP session. But note: alway login with the ixi-UMS installation account ! !